It's soooo hot here. It's always hot here in September. Other places are starting to feel like Autumn with an occasional crisp day, and we are burning up in Los Angeles. Not only that, my Air Conditioning took a break this week. Yup, it was hot! 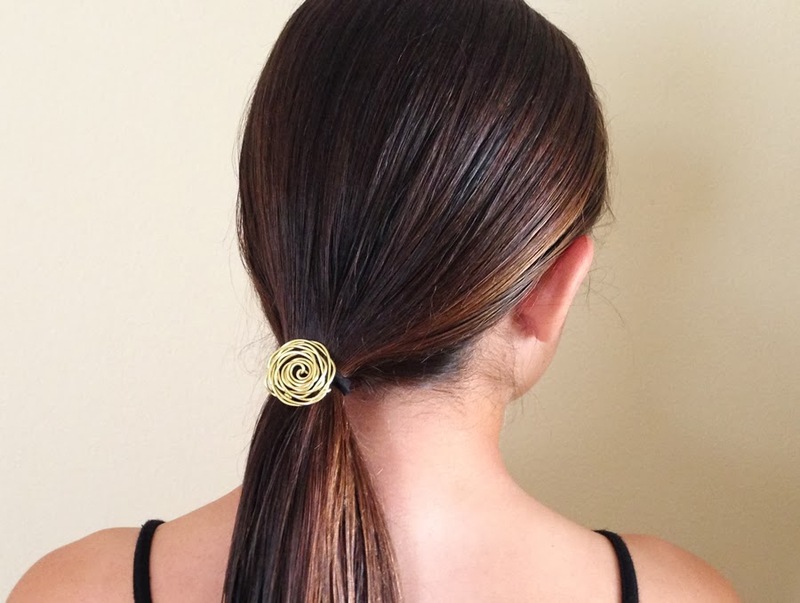 "Necessity is the mother of invention", and even though any hair tie would do, I've always loved a pretty pony tail. 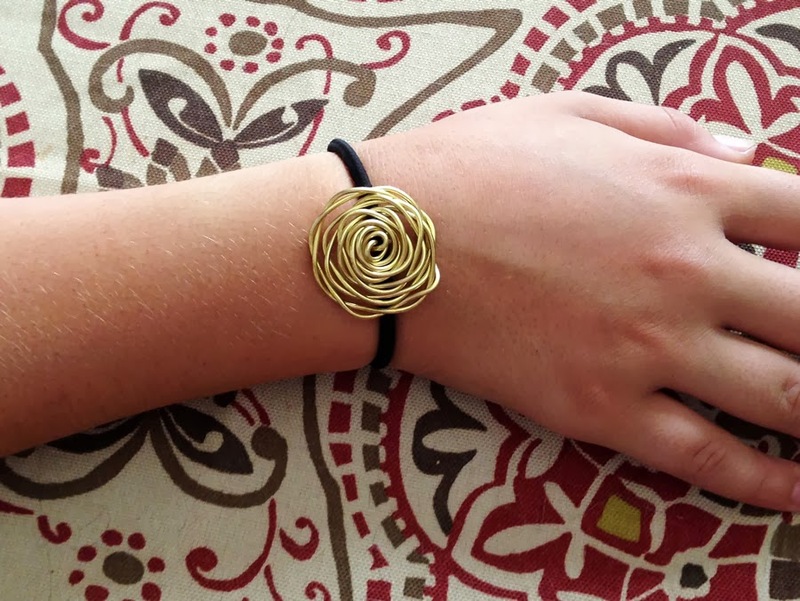 I decided to play with the wire rose design that I used for rings and see if it would work on a larger scale. 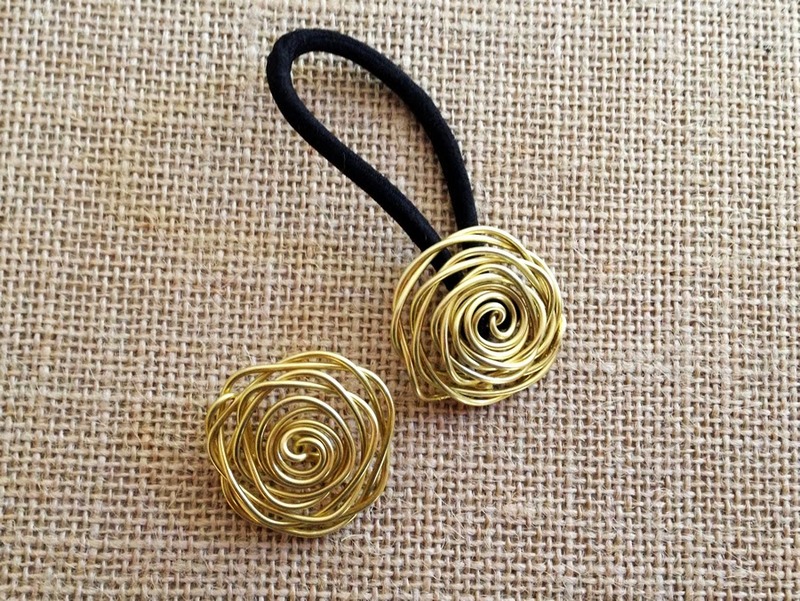 I used 16g brass wire for something a little different. I've never used brass wire before, and it is harder than copper, which was a good thing for this design. 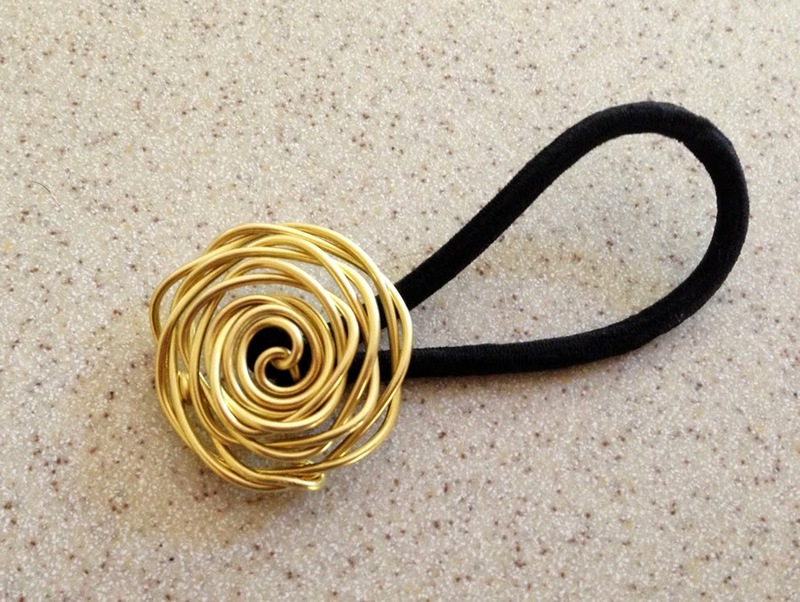 I didn't need to tumble the wire flower to work harden it. I'm very happy with the results! I wish I had my daughters gorgeous hair, but I probably did at her age. The only tricky part was attaching the rose embellishment to the pony tail holder. I originally just left a loop and used a larks head knot to attach the pony tail holder. It was effective, but a little messier than I wanted. Also, it pinned the rose in one spot which makes it harder to make it centered on the hair. 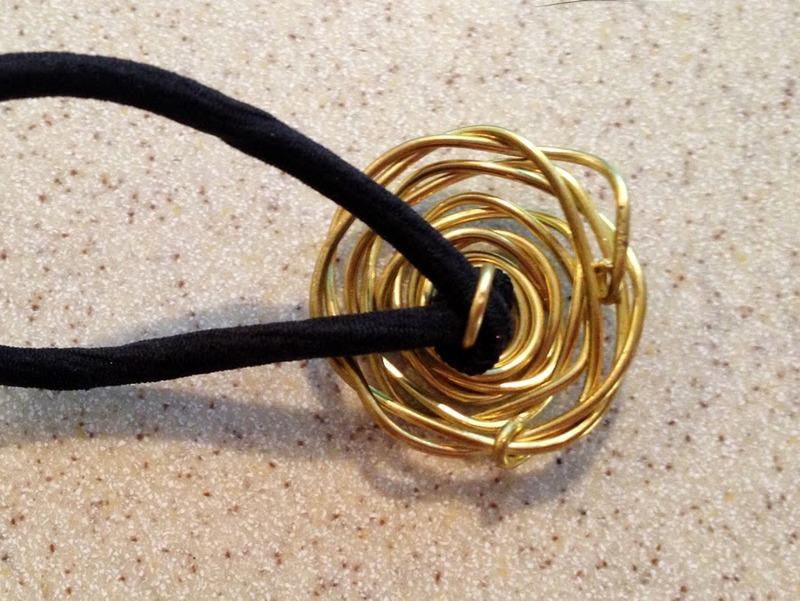 Instead of a simple loop, I folded the wire in half and made a hook to attach the elastic. This has several advantages. The hair elastic can be changed if you want a different color. Very practical if you plan to sell them. 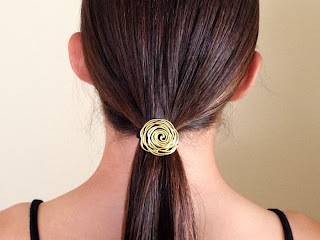 The flower embellishment can move on the elastic, so it can be positioned perfectly on the hair. The hair tie itself looks neat and professionally made from the back. I tucked and folded over the wire ends to prevent any possibility of them scratching or getting caught on anything. 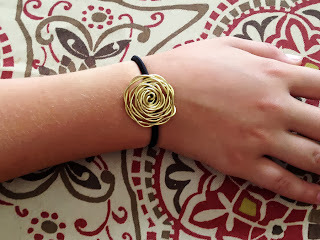 And as if you needed one more reason to make a great hair tie like this, I love the fact that when you throw one on your wrist to have it handy, it looks like a pretty bracelet instead of a piece of ugly elastic. And one more picture of how pretty they look in the hair. 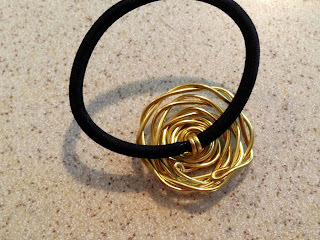 Once I started making hair ties I couldn't stop. I've been digging through my box of UFOs (Un-finished Objects) for more goodies to add to pony holders. I'll post them another day. 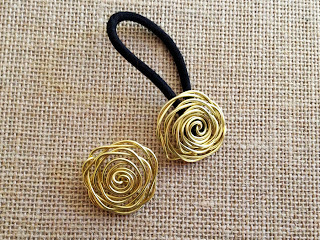 If you are interested in purchasing hair ties like this, I am planning to add them to my Etsy store this weekend.